Annalisa Sher is a young artist based out of San Francisco California. 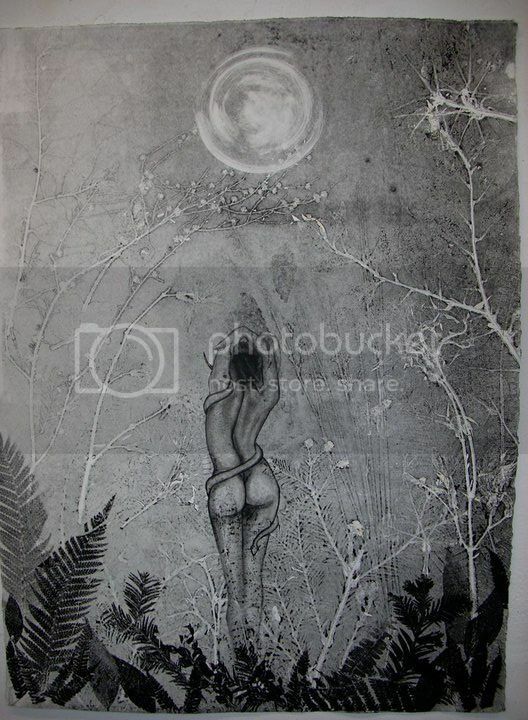 Her art mainly depicts the female figure, but she connects the female figure to earth in a very spiritual and symbolic way. There is a primitive nature to her art, but it is primitive in the sense that it connects the female gender together at its base. Women are individual, but they are also one. There is also an element of surrealism in her drawings. Her series “The Ocean Within” depicts women falling through space in a dreamlike quality, which calls on the viewer to reach inside and view what they themselves have suspended in time and space. Her craftsmanship in this series is beautiful, the way she drapes clothing is truly as if these women are suspended in time. There is both an urgency and calmness in this series, as if these women are forever suspended in a drop to their death. Her art has been shown in a few galleries in San Francisco, and they are sure to spread much like her craft is sure to grow. First off, thank you for taking the time to do this interview with us. Tell us a little bit about yourself (your childhood, your inspiration to start creating, etc). My name is Annalisa Sher, but everybody calls me Ani, (pronounced aw-nee). I was born and raised in Petaluma, a small town in the North Bay Area. My mother is a visual artist and my father is a musician and poet. From the very beginning of my life I had access to art supplies and the encouragement to be creative. I grew up out in the country on a few acres of land and had plenty of space to run around and explore. I didn’t have many friends as a child so I spent most of my time lost in my imagination. I also attended a Montessori elementary school where the teaching of art and self expression was highly valued. All of these things made it easy for me to start my life as an artist way early on. You feature the female body in a lot of your art. A lot of times it is presented in a very dark, dreamy quality. What is your main purpose behind interpreting femininity in this way? Much of it is self centered. Creating art is my own personal mediation, the most effective therapy, and the place in which I can explore the darker sides of myself with the greatest honesty. I find deep beauty in the female form. I find so much beauty in all forms of life and a big part of that beauty is ugliness. It’s about balance. I present myself out in the world as cheerful and full of smiles so when I am alone with my pencil and paper I am able to express others parts of myself that may not be as sunny. I appreciate the darkness and at the same time am scared shitless of my own and others’ feelings of sadness and anger. Making art is my way of confronting issues around death and pain and suffering. I am a feminine being and my connection to womanhood and the female form is ever present in my mind and therefore in my artwork. Take us through your creative process when starting a new project. When I start a new project I never know quite how it will evolve and ultimately materialize into finished work. I begin with a vision, either from a day dream or night dream or from the endless circulation of images running through my mind. At times I will browse the wild world of the internet to hone down on a specific image to work off of. Other times it all comes from the depths of my mind. I usually just go for it, straight to the final piece. Sometimes I’ll do a sketch or two but I prefer a minimal amount of planning and love to just let it flow. I get in there and if I hate it, I crumple it up or gesso over it and start again. You use so many different mediums in your art. What mediums have been your favorite or most rewarding to use? To be honest, my favorite material is a good ole black Bic pen. It’s lucky for me that this is the case because I work as a waitress to make rent and I am able to borrow black pens quite often from my generous employers. Is there a specific place in the world that has influenced you as an artist? I have spent most of my 23 years in the countryside of San Francisco’s Bay Area, so this has had a large impact on my life as an artist. I am a serious lover of nature and the great outdoors so much of my inspiration comes from the forests and the oceans and the mountains and the deserts. I have had the luck and pleasure of traveling to other parts of the world and with each new adventure I soak in as much imagery and memories as possible. I find that traveling keeps me excited and passionate and every time I hit the road I return home with much to make art about. You achieve such a vibrancy in your work without using very much color. Is there a reason you decided to use a gray scale in most of your work? Although I am a huge appreciator and lover of colors in life I choose to do most of my work on the gray scale because it simplifies things for me. I find that it lets me focus on the intention of the marks and the emotion of my imagery with much more clarity and in the end I tend to be happier with the black and white pieces over the color pieces. 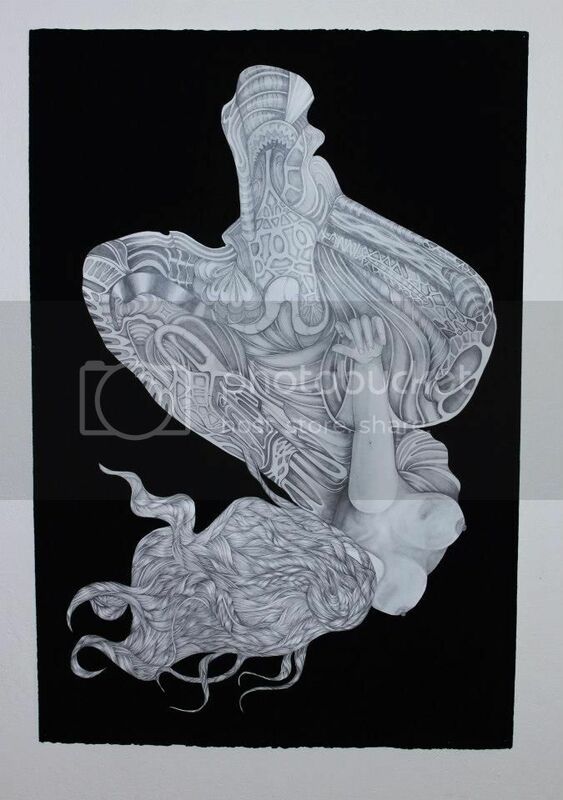 In your beautiful collection “The Ocean Within”, you depict women that seem to be floating through water or falling in space. Is there a particular point of view that you are expressing with these pieces? Can you tell us more about what this collection means to you? The Ocean Within series stemmed from a series of reoccurring dreams I was having in college in which I was suspended in ultimate nothingness, an internal ocean endlessly twirling. It was a space in which the only thing to do was panic, ponder, and ultimately find peace. I took the questions that arose in my head in the dreams and worked them out in waking life while creating these drawings. For me, these pieces bring up questions of identity and mortality, as well as the struggle between anxiety in the unknown and peace found in that darkness. After completing the collection of drawings the dreams stopped, but the deep ocean within me is ever present. What defines art for you? Do you feel there is a definition? Ah.. The million dollar question.. To me “Art” is simply defined as any endeavor of creative expression, in all of its glorious forms. Art is something that must and always will exist. Art is life. Can you tell us more about the use of internal organs and the way you seem to turn the human body “inside out” and, in some cases, connect it to nature? Where does the inspiration for this come from? Are you expressing a specific idea through these images? Not to sound cheesy, but I strongly believe that everything is connected. I see many similarities and I feel that nature repeats itself in various forms. For instance, I find the similarities between the circulatory system in my body and roots of a grand redwood tree to be comforting and beautiful. I am so grateful to be alive and without my body this would not be possible so I spend much of my drawing time focused inward. I am interested in human anatomy and the way it all works and at the same time I am fascinated with the ambiguity of my inner workings and how I, and everyone and everything, connect with the grand oneness of the universe. Whose work inspires and is an influence to you? I have so many artists that I look up to and draw inspiration from. The list would be too long to publish so I will keep it simple. First and for most, my mother is a huge inspiration. Her work is filled with such love and tenderness and I strive to be more like her every day. Also, I have many thanks to give to a young artist turned Angel, Phoebe Washer. Phoebe was a few years older than me and grew up in Petaluma as well. Her drawings and paintings are filled with wonder and beauty and speak deeply about the melancholy nature of life. I really respond to the emotions in her work and she will be an endless inspiration for me in my creative life. As a teenager I printed out her drawings off of myspace and copied them with such detail. She never knew it, but she taught me so much as a young artist and I keep her work close to my heart. Thank you Phoebe! What would you say to an aspiring artist? Do not stop, ever… The world needs you to be honest and be brave and be exactly who you are! You are beautiful! 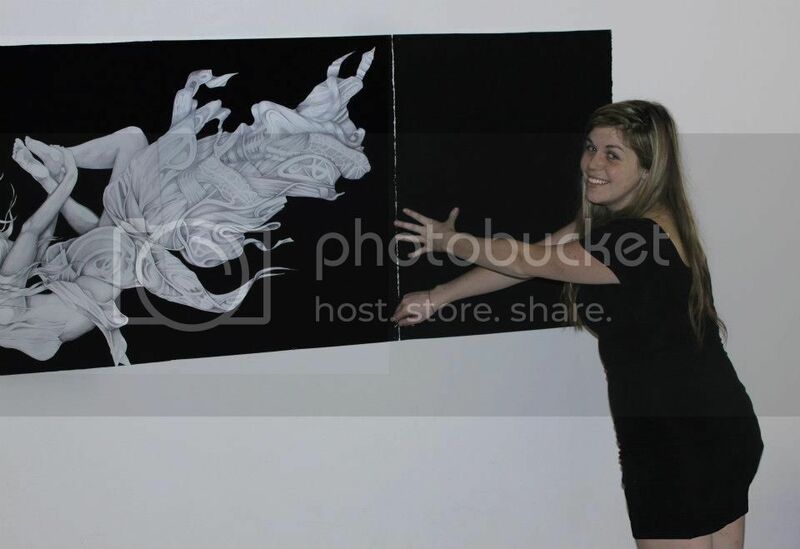 You can learn more about Annalisa Sher and her artwork on her facebook.